Travelling to Wolves last Saturday was always going to be an extremely difficult proposition. They have been excellent this season and it was always going to be a bit of a carnival for their last home game of the season, especially after being crowned as worthy champions. 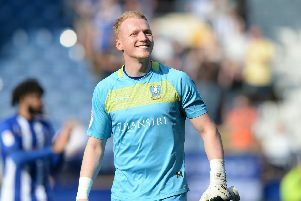 To take a point off of them was a fabulous result and as I had written a few weeks ago, the run in to the end of the season was incredibly important for the Sheffield Wednesday in my opinion. Jos Luhukay has most definitely steadied the ship and with the slow trickle of injured players becoming available, the performances and results have improved. It then leads us to the final game of what has been a highly turbulent and extremely disappointing season this Sunday against Norwich City. They say that you find out more about people or players when they are facing adversity and I think that can be seen as the case this season. I would have thought that the majority of supporters wouldn’t have really envisaged us finishing in the bottom half of the table and that has been dramatically improved over recent weeks with some excellent performances. This gives you some optimism for what lies ahead and I think it is good that the club have already started the rebuilding process by making decisions on personnel for next year. I am a firm believer in getting things done early, especially when it comes to recruiting new players. I really don’t understand these last minute dashes on deadline day when you do wonder how much desperation is involved rather than logical planning. The club have already announced whom they are releasing and both Glenn Loovens and Ross Wallace have had positive influences throughout their time here. Two of the better signings that have been made over the last few years and I am sure all Wednesday fans would wish them well in their future careers wherever that may take them. The recruitment of new players is massively important and even more so this summer. We have a squad of ageing players, some of whom are reportedly on big financial contracts so the opportunity to off load anyone else does seem limited. There is an abundance of young fresh talent breaking through from the U23’s and this has to be encouraged but only if they are up to the task. For what its worth I think that the majority of the youngsters have come into a team that was struggling for both confidence and results and they all did an excellent job. There has been much talk of the vast number of injuries that the players have sustained this season and their fitness has been called into question. This is something that has to be reviewed and learnt from. Thorough pre-season training lays the foundations for the season and when the first ball is kicked in August you should be ready for the campaign ahead. In hindsight the tough campaign won't have done us any harm really. It has brought everybody’s feet firmly back down to earth and the realisation that the Championship is a tough league to get out of. Hopefully the sun will be shining on Sunday as it usually does on the last game of the season. The players can put in a strong performance and leave us with a sweet taste in the mouth for the summer break.